The mushroom cloud of the atomic bombing of Nagasaki, Japan on August 9, 1945 rose some 11 miles (18 km) above the bomb's hypocenter. A nuclear weapon is an explosive device that derives its destructive force from nuclear reactions, either fission or a combination of fission and fusion. Both reactions release vast quantities of energy from relatively small amounts of matter. The first fission ("atomic") bomb test released the same amount of energy as approximately 20,000 tons of TNT. The first thermonuclear ("hydrogen") bomb test released the same amount of energy as approximately 10,000,000 tons of TNT. A thermonuclear weapon weighing little more than 2,400 pounds (1,100 kg) can produce an explosive force comparable to the detonation of more than 1.2 million tons (1.1 million tonnes) of TNT. Thus, even a small nuclear device no larger than traditional bombs can devastate an entire city by blast, fire, and radiation. Nuclear weapons are considered weapons of mass destruction, and their use and control have been a major focus of international relations policy since their debut. Two nuclear weapons have been used in the course of warfare, both times by the United States near the end of World War II. On 6 August 1945, a uranium gun-type fission bomb code-named "Little Boy" was detonated over the Japanese city of Hiroshima. 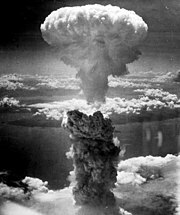 Three days later, on 9 August, a plutonium implosion-type fission bomb code-named "Fat Man" was exploded over Nagasaki, Japan. These two bombings resulted in the deaths of approximately 200,000 people—mostly civilians—from acute injuries sustained from the explosions. The role of the bombings in Japan's surrender, and their ethical status, remain the subject of scholarly and popular debate. Since the bombings of Hiroshima and Nagasaki, nuclear weapons have been detonated on over two thousand occasions for testing purposes and demonstrations. Only a few nations possess such weapons or are suspected of seeking them. The only countries known to have detonated nuclear weapons—and that acknowledge possessing such weapons—are (chronologically by date of first test) the United States, the Soviet Union (succeeded as a nuclear power by Russia), the United Kingdom, France, the People's Republic of China, India, Pakistan, and North Korea. Israel is also widely believed to possess nuclear weapons, though it does not acknowledge having them. One state, South Africa, fabricated nuclear weapons in the past, but as its apartheid regime was coming to an end it disassembled its arsenal, acceded to the Nuclear Non-Proliferation Treaty, and accepted full-scope international safeguards. The Federation of American Scientists estimates there are more than 17,000 nuclear warheads in the world as of 2012, with around 4,300 of them considered "operational", ready for use. In fission weapons, a mass of fissile material (enriched uranium or plutonium) is assembled into a supercritical mass—the amount of material needed to start an exponentially growing nuclear chain reaction—either by shooting one piece of sub-critical material into another (the "gun" method) or by compressing a sub-critical sphere of material using chemical explosives to many times its original density (the "implosion" method). The latter approach is considered more sophisticated than the former and only the latter approach can be used if the fissile material is plutonium. The other basic type of nuclear weapon produces a large proportion of its energy in nuclear fusion reactions. Such fusion weapons are generally referred to as thermonuclear weapons or more colloquially as hydrogen bombs (abbreviated as H-bombs), as they rely on fusion reactions between isotopes of hydrogen (deuterium and tritium). All such weapons derive a significant portion, and sometimes a majority, of their energy from fission. This is because a fission weapon is required as a "trigger" for the fusion reactions, and the fusion reactions can themselves trigger additional fission reactions. Only six countries—United States, Russia, United Kingdom, People's Republic of China, France and India—have conducted thermonuclear weapon tests. (Whether India has detonated a "true", multi-staged thermonuclear weapon is controversial.) Thermonuclear weapons are considered much more difficult to successfully design and execute than primitive fission weapons. Almost all of the nuclear weapons deployed today use the thermonuclear design because it is more efficient. Because of the immense military power they can confer, the political control of nuclear weapons has been a key issue for as long as they have existed; in most countries the use of nuclear force can only be authorized by the head of government or head of state. Proponents of nuclear disarmament say that it would lessen the probability of nuclear war occurring, especially accidentally. Critics of nuclear disarmament say that it would undermine the present nuclear peace and deterrence and would lead to increased global instability. Various American elder statesmen, who were in office during the Cold War period, have recently been advocating the elimination of nuclear weapons. These officials include Henry Kissinger, George Shultz, Sam Nunn, and William Perry. In January 2010, Lawrence M. Krauss stated that "no issue carries more importance to the long-term health and security of humanity than the effort to reduce, and perhaps one day, rid the world of nuclear weapons". 7 June 1960: the 1960 Fort Dix IM-99 accident destroyed a Boeing CIM-10 Bomarc nuclear missile and shelter and contaminated the BOMARC Missile Accident Site in New Jersey. 24 January 1961: the 1961 Goldsboro B-52 crash occurred near Goldsboro, North Carolina. A B-52 Stratofortress carrying two Mark 39 nuclear bombs broke up in mid-air, dropping its nuclear payload in the process. 1965 Philippine Sea A-4 crash, where a Skyhawk attack aircraft with a nuclear weapon fell into the sea. The pilot, the aircraft, and the B43 nuclear bomb were never recovered. It was not until the 1980s that the Pentagon revealed the loss of the one-megaton bomb. According to an audit by the Brookings Institution, between 1940 and 1996, the U.S. spent $8.75 trillion in present day terms on nuclear weapons programs. 57 percent of which was spent on building nuclear weapons delivery systems. 6.3 percent of the total, $549 billion in present day terms, was spent on Environmental remediation and nuclear waste management, for example cleaning up the Hanford site, and 7 percent of the total, $615 billion was spent on making nuclear weapons themselves. The 1962 Sedan nuclear test formed a crater 100 m (330 ft) deep with a diameter of about 390 m (1,300 ft), as a means of investigating the possibilities of using peaceful nuclear explosions for large-scale earth moving. The 140 kiloton Soviet Chagan (nuclear test), comparable in yield to the Sedan test of 104 kt, formed Lake Chagan, reportedly used as a watering hole for cattle and human swimming. Apart from their use as weapons, nuclear explosives have been tested and used for various non-military uses. These have included large-scale earth moving and the creation of artificial bays. Due to the inability of the physicists to reduce the fission fraction of small, approximately 1 kiloton, yield nuclear devices that would have been required for many civil engineering projects, when long term health and clean-up costs from fission products were included in the cost, there was virtually no economic advantage over conventional explosives, except for potentially the very largest of projects. At the peak of the Atomic Age, the United States Federal government initiated Operation Plowshare, involving "peaceful nuclear explosions". The United States Atomic Energy Commission chairman announced that the Plowshares project was intended to "highlight the peaceful applications of nuclear explosive devices and thereby create a climate of world opinion that is more favorable to weapons development and tests". The Operation Plowshare program included 27 nuclear tests designed towards investigating these non-weapons uses from 1961 through 1973. No route was shorter than 55 kilometers in length. 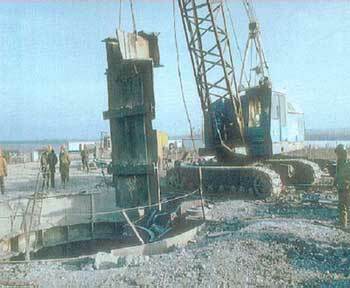 The Qattara Depression Project, as developed by Professor Friedrich Bassler who during his appointment to the West German ministry of economics in 1968 put forth a plan to create a Saharan lake and hydroelectric power station by blasting a tunnel between the Mediterranean sea and the Qattara Depression in Egypt, an area that lies below sea level. The core problem of the entire project was the water supply to the depression. Calculations by Bassler showed that digging a canal or tunnel would be too expensive, therefore Bassler determined that the use of nuclear explosive devices, to excavate the canal or tunnel, would be the most economical. The Egyptian government declined to pursue the idea. The Soviet Union's Nuclear Explosions for the National Economy was a program in the Soviet Union that investigated non-weapons uses of nuclear explosions. These included one 30 kiloton explosion being used to close the Uzbekistani Urtabulak gas well in 1966 that had been blowing since 1963, and a few months later a 47 kiloton explosive was used to seal a higher pressure blowout at the nearby Pamuk gas field. The public records for devices that produced the highest proportion of their yield via fusion-only reactions are possibly the Soviet peaceful nuclear explosions of the 1970s, with 98% of their 15 kiloton explosive yield being derived from fusion reactions, a total fission fraction of 0.3 kilotons in a 15 kt device. The repeated detonation of nuclear devices underground in salt domes, in a somewhat analogous manner to the explosions that power a car internal combustion engine(in that it would be a heat engine) has also been proposed as a means of fusion power, in what is termed PACER. Other investigated uses for peaceful nuclear explosions were underground detonations to stimulate, by a process analogous to fracking, the flow of petroleum and natural gas in tight formations, this was most developed in the Soviet Union, with an increase in the production of many well heads being reported. The discovery and synthesis of new chemical elements by nuclear transmutation, and their production in the necessary quantities to allow the studying of their properties, was carried out in nuclear explosive device testing. 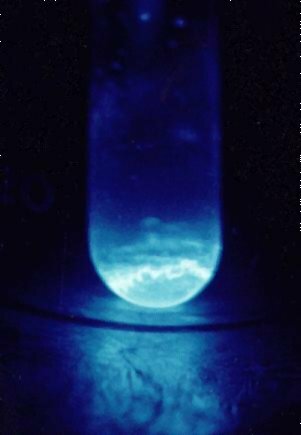 For example, the discovery of the short lived einsteinium and fermium, both created under the intense neutron flux environment within thermonuclear explosions, followed the first Teller-Ulam thermonuclear device test - Ivy Mike. The rapid capture of so many neutrons required in the synthesis of einsteinium would provide the needed direct experimental confirmation of the so-called r-process, the multiple neutron absorptions needed to explain the cosmic nucleosynthesis (production) of all heavy chemical elements heavier than nickel on the periodic table, in supernova explosions, before beta decay, with the r-process explaining the existence of many stable elements in the universe. In 2008 the worldwide presence of new isotopes from atmospheric testing beginning in the 1950s was developed into a reliable way of detecting art forgeries, as all paintings created after that period may contain traces of caesium-137 and strontium-90, isotopes that did not exist in nature before 1945. Fission products like Cs-137 and Sr-90 did occur in nature prior to 1945, being produced in the natural nuclear fission reactor at Oklo, but almost all traces of them had long since decayed away before the rise of even the earliest known human painting. Soviet nuclear physicist and Nobel peace prize recipient Andrei Sakharov also proposed the idea that earthquakes could be mitigated and particle accelerators could be made by utilizing nuclear explosions, with the latter created by connecting a nuclear explosive device with another of his inventions, the explosively pumped flux compression generator, to accelerate protons to collide with each other to probe their inner workings, an endeavor that is presently done at much lower energy levels with non-explosive superconducting magnets in CERN. Sakharov suggested to replace the copper coil in his MK generators by a big superconductor solenoid to magnetically compress and focus underground nuclear explosions into a shaped charge effect. He theorized this could focus 1023 positively charged protons per second on a 1 mm2 surface, then envisaged making two such beams collide in the form of a supercollider. 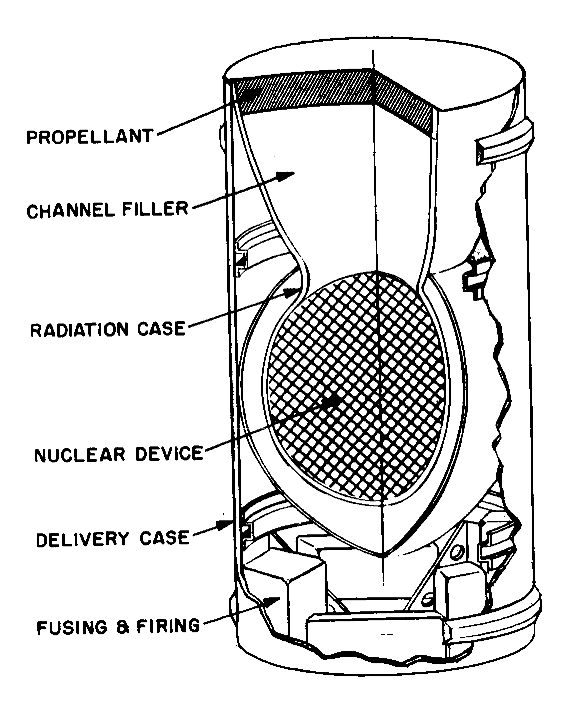 Project A119, proposed in the 1960s, which as Apollo scientist Gary Latham explained, would have been the detonating of a "smallish" nuclear device on the Moon in order to facilitate research into its geologic make-up. Analogous in concept to the comparatively low yield explosion created by the water prospecting (LCROSS)Lunar Crater Observation and Sensing Satellite mission, which launched in 2009 and released the "Centaur" kinetic energy impactor, an impactor with a mass of 2,305 kg (5,081 lb), and an impact velocity of about 9,000 km/h (5,600 mph), releasing the kinetic energy equivalent of detonating approximately 2 tons of TNT (8.86 GJ). Nuclear stand-off explosions are assessed to be 10-100 times more effective than the non-nuclear alternatives analyzed in this study. Other techniques involving the surface or subsurface use of nuclear explosives may be more efficient, but they run an increased risk of fracturing the target near-Earth object. They also carry higher development and operations risks. However, if the need arises to use nuclear explosive devices to prevent an asteroid impact event, it may face the legal issue that presently the United Nations Committee on the Peaceful Uses of Outer Space, and the 1996 Comprehensive Nuclear-Test-Ban Treaty technically ban nuclear weapons in space. ↑ "Frequently Asked Questions #1". Radiation Effects Research Foundation. http://www.rerf.or.jp/general/qa_e/qa1.html. Retrieved Sep 18, 2007. "total number of deaths is not known precisely ... acute (within two to four months) deaths ... Hiroshima ... 90,000－166,000 ... Nagasaki ... 60,000－80,000"
↑ 4.0 4.1 "Federation of American Scientists: Status of World Nuclear Forces". Fas.org. http://www.fas.org/programs/ssp/nukes/nuclearweapons/nukestatus.html. Retrieved 2012-12-29. ↑ "Nuclear Weapons – Israel". Fas.org. Jan 8, 2007. http://www.fas.org/nuke/guide/israel/nuke/index.html. Retrieved 2010-12-15. ↑ "Nuclear Weapons – South Africa". Fas.org. May 29, 2000. http://www.fas.org/nuke/guide/rsa/nuke/index.html. Retrieved 2011-04-07. ↑ 8.0 8.1 8.2 8.3 8.4 8.5 The best overall printed sources on nuclear weapons design are: Hansen, Chuck. U.S. Nuclear Weapons: The Secret History. San Antonio, TX: Aerofax, 1988; and the more-updated Hansen, Chuck. Swords of Armageddon: U.S. Nuclear Weapons Development since 1945. Sunnyvale, CA: Chukelea Publications, 1995. ↑ David Albright and Kimberly Kramer (2005-08-22). "Neptunium 237 and Americium: World Inventories and Proliferation Concerns". Institute for Science and International Security. http://isis-online.org/uploads/isis-reports/documents/np_237_and_americium.pdf. Retrieved 2011-10-13. ↑ Sublette, Carey. "The Nuclear Weapon Archive". http://nuclearweaponarchive.org/. Retrieved 2007-03-07. ↑ "Page discussing the possibility of using antimatter as a trigger for a thermonuclear explosion". Cui.unige.ch. http://cui.unige.ch/isi/sscr/phys/anti-BPP-3.html. Retrieved 2013-05-30. ↑ "Paper discussing the number of antiprotons required to ignite a thermonuclear weapon". Arxiv.org. 1970. arXiv:physics/0507114. ↑ Keay Davidson, Chronicle Science Writer (2004-10-04). "Air Force pursuing antimatter weapons: Program was touted publicly, then came official gag order". Sfgate.com. http://sfgate.com/cgi-bin/article.cgi?file=/c/a/2004/10/04/MNGM393GPK1.DTL. Retrieved 2013-05-30. ↑ Stephen I. Schwartz, ed., Atomic Audit: The Costs and Consequences of U.S. Nuclear Weapons Since 1940. Washington, D.C.: Brookings Institution Press, 1998. See also Estimated Minimum Incurred Costs of U.S. Nuclear Weapons Programs, 1940–1996, an excerpt from the book. ↑ Creveld, Martin Van (2000). "Technology and War II:Postmodern War?". In Charles Townshend. The Oxford History of Modern War. New York, USA: Oxford University Press. p. 349. ISBN 0-19-285373-2. ↑ 22.0 22.1 Kenneth Waltz, "The Spread of Nuclear Weapons: More May Better," Adelphi Papers, no. 171 (London: International Institute for Strategic Studies, 1981). ↑ See, for example: Feldman, Noah. "Islam, Terror and the Second Nuclear Age," New York Times Magazine (29 October 2006). ↑ Gallucci, Robert (September 2006). "Averting Nuclear Catastrophe: Contemplating Extreme Responses to U.S. Vulnerability". pp. pp. 51–58. Digital object identifier:10.1177/0002716206290457. http://ann.sagepub.com/content/607/1/51.abstract. Retrieved 28 January 2013. ↑ 26.0 26.1 Allison, Graham (13 March 2009). "How to Keep the Bomb From Terrorists". http://www.thedailybeast.com/newsweek/2009/03/13/how-to-keep-the-bomb-from-terrorists.html. Retrieved 28 January 2013. ↑ 28.0 28.1 Preparatory Commission for the Comprehensive Nuclear-Test-Ban Treaty Organization (2010). "Status of Signature and Ratification". Accessed 27 May 2010. Of the "Annex 2" states whose ratification of the CTBT is required before it enters into force, China, Egypt, Iran, Israel, and the United States have signed but not ratified the Treaty. India, North Korea, and Pakistan have not signed the Treaty. ↑ Mark Diesendorf (2013). "Book review: Contesting the future of nuclear power". Energy Policy. http://www.ies.unsw.edu.au/sites/all/files/MD%20BookReview_EnergyPolicy2013.pdf. ↑ Gusterson, Hugh, "Finding Article VI" Bulletin of the Atomic Scientists (8 January 2007). ↑ Jim Hoagland (October 6, 2011). "Nuclear energy after Fukushima". Washington Post. http://articles.washingtonpost.com/2011-10-06/opinions/35279184_1_nuclear-weapons-nuclear-power-nuclear-energy. ↑ "Obama Prague Speech On Nuclear Weapons". Huffingtonpost.com. http://www.huffingtonpost.com/2009/04/05/obama-prague-speech-on-nu_n_183219.html. Retrieved 2013-05-30. ↑ "CNN Poll: Public divided on eliminating all nuclear weapons". Politicalticker.blogs.cnn.com. 2010-04-12. http://politicalticker.blogs.cnn.com/2010/04/12/cnn-poll-public-divided-on-eliminating-all-nuclear-weapons/. Retrieved 2013-05-30. ↑ Hugh Gusterson (30 March 2012). "The new abolitionists". Bulletin of the Atomic Scientists. http://thebulletin.org/new-abolitionists. ↑ ODS Team. "Renewing the United Nations: A Program for Reform (A/51/950)". Daccess-dds-ny.un.org. http://daccess-dds-ny.un.org/doc/UNDOC/GEN/N97/189/79/IMG/N9718979.pdf?OpenElement. Retrieved 2013-05-30. ↑ 43.0 43.1 Jerry Brown and Rinaldo Brutoco (1997). Profiles in Power: The Anti-nuclear Movement and the Dawn of the Solar Age, Twayne Publishers, pp. 191-192. ↑ Barry Schneider (May 1975). "Big Bangs from Little Bombs". p. 28. http://books.google.com/?id=dQsAAAAAMBAJ. Retrieved 2009-07-13. ↑ James C. Oskins, Michael H. Maggelet (2008). Broken Arrow — The Declassified History of U.S. Nuclear Weapons Accidents. lulu.com. ISBN 1-4357-0361-8. http://books.google.com/?id=gi7HARO8vTcC. Retrieved 2008-12-29. ↑ "Ticonderoga Cruise Reports" (Navy.mil weblist of Aug 2003 compilation from cruise reports). http://www.history.navy.mil/download/cv-deploy-vietnam.htm. Retrieved 2012-04-20. "The National Archives hold[s] deck logs for aircraft carriers for the Vietnam Conflict." ↑ Broken Arrows at www.atomicarchive.com. Accessed Aug 24, 2007. ↑ "U.S. Confirms '65 Loss of H-Bomb Near Japanese Islands". May 9, 1989. p. A–27. ↑ Hayes, Ron (January 17, 2007). "H-bomb incident crippled pilot's career". Palm Beach Post. Archived from the original on 2011-06-16. //web.archive.org/web/20110616223334/http://www.palmbeachpost.com/localnews/content/local_news/epaper/2007/01/17/m1a_Hbomb_0117.html?cxtype=rss&cxsvc=7&cxcat=17. Retrieved 2006-05-24. ↑ Maydew, Randall C. (1997). America's Lost H-Bomb: Palomares, Spain, 1966. Sunflower University Press. ISBN 978-0-89745-214-4. ↑ Long, Tony (January 17, 2008). "Jan. 17, 1966: H-Bombs Rain Down on a Spanish Fishing Village". WIRED. http://www.wired.com/science/discoveries/news/2008/01/dayintech_0117. Retrieved 2008-02-16. ↑ 52.0 52.1 52.2 Wolfgang Rudig (1990). Anti-nuclear Movements: A World Survey of Opposition to Nuclear Energy, Longman, p. 54-55. ↑ "Report on the Health Consequences to the American Population from Nuclear Weapons Tests Conducted by the United States and Other Nations". CDC. http://www.cdc.gov/nceh/radiation/fallout/. Retrieved 7 December 2013. ↑ 57.0 57.1 Jim Falk (1982). Global Fission: The Battle Over Nuclear Power, Oxford University Press, pp. 96–97. ↑ "A brief history of CND". Cnduk.org. http://www.cnduk.org/pages/binfo/hist.html. Retrieved 2013-05-30. ↑ "Early defections in march to Aldermaston". Guardian Unlimited. 1958-04-05. http://century.guardian.co.uk/1950-1959/Story/0,,105488,00.html. ↑ Russia Today documentary that visits the lake at around the 1 minute mark on YouTube. ↑ "Q&A with Scott Kirsch: Digging with bombs". Usnews.com. http://www.usnews.com/usnews/news/articles/060106/6kirsch.htm. Retrieved 2010-11-25. ↑ Charles Perrow (September/October 2013 vol. 69 no. 5). "Nuclear denial: From Hiroshima to Fukushima". Bulletin of the Atomic Scientists. http://bos.sagepub.com/content/69/5/56.full. ↑ 71.0 71.1 Nordyke, M. D. (2000-09-01). "Extinguishing Runaway Gas Well Fires". The Soviet Program for Peaceful Uses of Nuclear Explosions. Lawrence Livermore National Laboratory. pp. 34–35. Digital object identifier:10.2172/793554. Report no. : UCRL-ID-124410 Rev 2. https://e-reports-ext.llnl.gov/pdf/238468.pdf. U. S. Department of Energy contract no. : W-7405-Eng48. ↑ The Soviet Program for Peaceful Uses of Nuclear Explosions by Milo D. Nordyke. Science & Global Security, 1998, Volume 7, pp. 1-117. See test shot "Taiga". ↑ "Can past nuclear explosions help detect forgeries?". Theartnewspaper.com. http://www.theartnewspaper.com/article.asp?id=8529. Retrieved 2010-11-25. ↑ "Nuclear weapons' surprising contribution to climate science". Phys.org. 2012-07-13. http://phys.org/news/2012-07-nuclear-weapons-contribution-climate-science.html. Retrieved 2013-05-30. ↑ "Going Nuclear Over the Pacific | Past Imperfect". Blogs.smithsonianmag.com. http://blogs.smithsonianmag.com/history/2012/08/going-nuclear-over-the-pacific/. Retrieved 2013-05-30. ↑ https://www.fas.org/irp/threat/mctl98-2/p2sec06.pdf SECTION VI NUCLEAR WEAPONS EFFECTS TECHNOLOGY II-6-28. ↑ "Travel time analysis of P waves arising from six underground nuclear explosion at Novaya Zemlya". Annalsofgeophysics.eu. http://www.annalsofgeophysics.eu/index.php/annals/article/view/4815. Retrieved 2013-05-30. ↑ "Upper Mantle Heterogeneities from Active and Passive Seismology". Springer.com. 1997-04-16. https://www.springer.com/earth+sciences+and+geography/geophysics/book/978-0-7923-4877-1. Retrieved 2013-05-30. ↑ "A Database Of Deep Seismic Sounding Peaceful Nuclear Explosion Recordings For Seismic Monitoring Of Northern Eurasia" (PDF). http://www.dtic.mil/cgi-bin/GetTRDoc?AD=ADA527730&Location=U2&doc=GetTRDoc.pdf. Retrieved 2013-05-30. ↑ "Moon madness". December 21, 1969. p. 19. http://news.google.com/newspapers?id=ZJApAAAAIBAJ&sjid=5-cDAAAAIBAJ&pg=5506,6803546. Retrieved September 9, 2011. ↑ "NASA's LCROSS Mission Changes Impact Crater". NASA. 2009-09-29. http://www.nasa.gov/centers/ames/news/features/2009/LCROSS_new_crater.html. Retrieved 2009-11-21. ↑ http://link.springer.com/chapter/10.1007/978-0-387-30453-3_17 Laser ablation and its applications, Laser Propulsion Thrusters for Space Transportation. ↑ "Roundtrip Interstellar Travel Using Laser-Pushed Lightsails. VOL. 21, NO. 2, MARCH-APRIL 1984 J. SPACECRAFT. Robert Forward et. al" (PDF). http://path-2.narod.ru/design/base_e/rit-1.pdf. Retrieved 2013-05-30. ↑ Dillow, Clay (9 April 2012). "How it Would Work: Destroying an Incoming Killer Asteroid With a Nuclear Blast". Bonnier. http://www.popsci.com/technology/article/2012-04/how-it-would-work-destroying-incoming-killer-asteroid-nuclear-blast. Retrieved 6 January 2013. (French) Jean-Hugues Oppel, Réveillez le président, Éditions Payot et rivages, 2007 (ISBN978-2-7436-1630-4). The book is a fiction about the nuclear weapons of France; the book also contains about ten chapters on true historical incidents involving nuclear weapons and strategy.